The paper reports on experiments in which robotic agents and software agents are set up to originate language and meaning. The experiments test the hypothesis that mechanisms for generating complexity commonly found in biosystems, in particular self-organisation, co-evolution, and level formation, also may explain the spontaneous formation, adaptation, and growth in complexity of language. Keywords: origins of language, origins of meaning, self-organisation, distributed agents, open systems. 1 Introduction A good way to test a model of a particular phenomenon is to build simulations or artificial systems that exhibit the same or similar phenomena as one tries to model. This methodology can also be applied to the problem of the origins of language and meaning. Concretely, experiments with robotic agents and software agents could be set up to test whether certain hypothesised mechanisms indeed lead to the formation of language and the creation of new meaning. 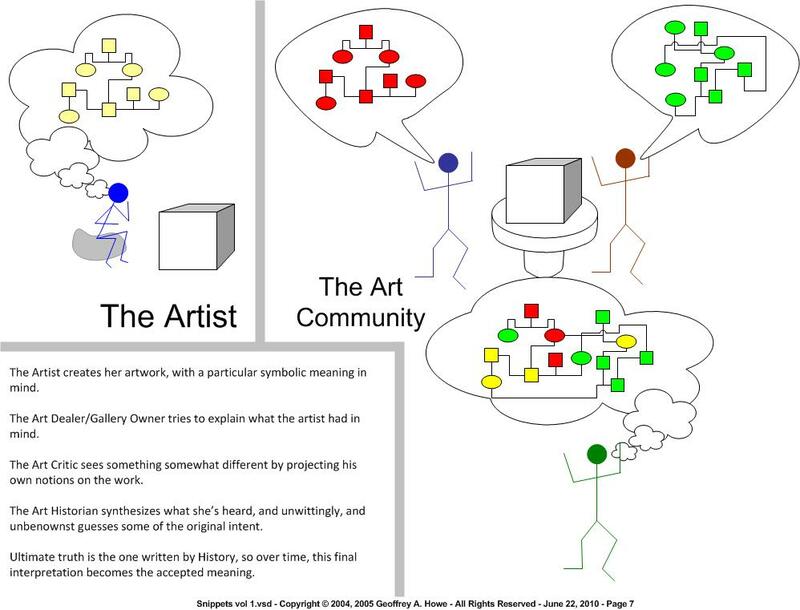 Interestingly enough, I ran into this work a couple years after I had written down an early musing about context (see my earlier post “The origin of a context“). At the time that I ran into Luc Steels research, I was struck with how similarly I had framed the issue. While his experiments were about much more than context, it certainly was encouraging to me that the results of the experiments he carried out corroborated my naive expressions. The basic setup of the experiment was as follows. Two computers, two digital cameras, and microphones and speakers permitting the software to “talk”. The cameras had some sort of pointing mechanism (laser pointers, I think) and faced a white board on which various shapes of different colors were arrayed randomly. The two software agents took turns pointing their laser pointers at the shapes and then generating various sounds. As the game continued, each agent would try to mimic the sounds they heard each other make while pointing at specific objects. Over time, the two agents were able to replicate the sounds when pointing at the same objects. In terms of what I consider to be context, these experiments showed that it was possible for two “autonomous agents” to come to agreement on the “terminology” they would mutually use to refer to the same external perceptions (images of colored objects seen through a digital camera). Once trained, the two agents could “converse” about the objects, even pointing them out to each other and correctly finding the objects referred to when mentioned. These experiments also showed that if you take software agents who have been trained separately (with other partner agents) and put them together, they will go through a period of renegotiation of terms and pronunciations. The robot experiments show a dramatic, destructive period in which the robots almost start over, generating an entirely new language, but finally the two agents again converge on something they agree on. I’m not sure if the study continued to research context, per se. The later study included “mobile” agents and permitted interactions with several agents in a consecutive fashion. This showed the slow “evolution” of the language (a convergence of terminology amongst several agents) among a larger group of agents. I suspect, that unless the experimenters explicitly looked for this, they may have missed this detail (I’d be interested in finding out). What would have been terrific is if the agent kept track of WHO it was talking to as well as what was being talked about. It is that extra piece of information which makes up a context. If an agent were able to learn the terminology of one agent, then learn the language of another, it could act as a translator between the two by keeping track of who it was talking with (and switching contexts…). Under my view, context is just the recognition of who I’m talking to and thus the selection of the correct variant of language and terminology to adapt to that audience. On this blog and in the writings of many other people through history, the idea of “context” as a component of the definition, interpretation and usage of symbols plays a large role. Be it called “situational” or “cultural” or any of a number of sometimes more and sometimes less academic notions, context provides the key (just as a cipher is a key to an encryption code) to interpreting any message. Without knowing the context, many messages will be uninterpretable, or even worse, unrecognizable. But what is “context” really? Where does it come from? Here is my decidedly informal discription. A conversation starts and one tells a story. The other listens, interpreting silently what she hears into her own experiences. She then responds, reflecting what she thought she heard, but with a variation or two. The first person agrees with some of her response. He hadn’t at first thought of the variation, but now that she’s mentioned it, he knows she’s on to something. The two part company, carrying a memory of their conversation. When they meet again, they will reinforce and reiterate their common perceptions on the matter. This is the origin point of CONTEXT: the set of principles and concepts that the two agree about, and the shared vocabulary they have used to describe them.